I am a missionary. I am an author. And yes, I am a magician. I am husband to an amazing woman and dad to two incredible boys. We call Florence, SC home. We live and work in Metro Manila, Philippines. We call that home too. In addition to all this, I’ve been told my signature looks like a tangled mess of wire. I hope that’s not true. Click here to subscribe to my blog feed! Thanks for taking the time to add me to those you follow on Twitter. Not sure how you found me on the ‘T’ but thanks. I see you are on the mission field… Super! I am always glad when I see those who are willing to go and follow the calling. I have one that may be heading upon graduation, but that is at least 2 years away. A second child may as well… but that is 4 years off at this point. However, with 6 kids, I am sure someone will be in full time service. I must ask, the sirname, Buxton…not a common name. I went to school with a Karen Buxton, no relation is there? Graduated in 1973, South Florida. May God bless as you serve with your lovely wife. Thanks for the blessings! That is very exciting that your child is considering mission work. I invite you to check out our short term trips and internship opportunities: visit impactingasia.org and click on vision trips (Impacting Asia is a ministry run by my brother-in-law, and they handle teams coming to work with our Global Surge team). 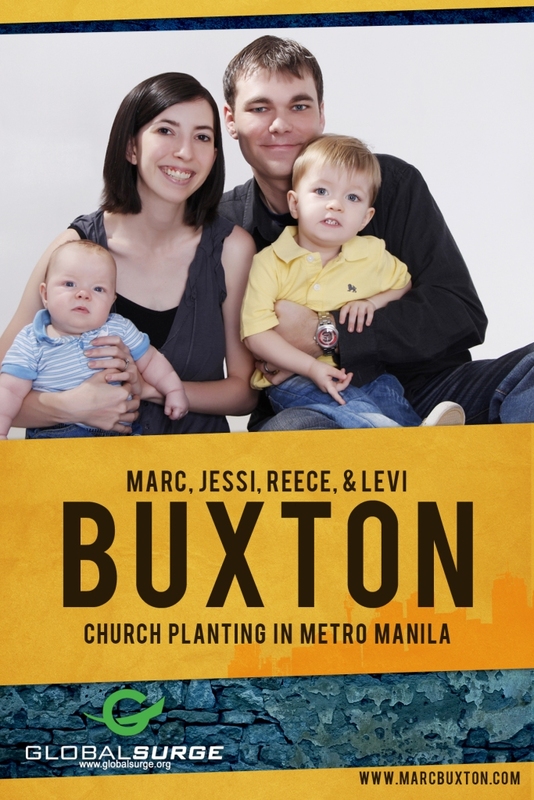 My family moved from England when my granddad was 10 years old – Buxton is an English name. I don’t know of any relation to Karen Buxton, but it’s possible! I’m amazed to see ur blog Sir Marc! Have a blessed journey ahead along ur family and community.